Sablés, also known as a French Butter Cookie or Breton Biscuit, are a classic French cookie originating in Normandy France. The name 'Sablés' is French for "sand", which refers to the sandy texture of this delicate and crumbly cookie. The traditional shape is round with fluted edges and the tops of the cookies are usually brushed with an egg wash to give them a shiny appearance. The finishing touch, which makes them instantly recognizable, is to score a criss-cross pattern on the top of each cookie. The flavor of these Sablés is dependent on the quality of your ingredients, especially the butter and vanilla extract. Butter is what gives these cookies their wonderful flavor so use the best you can afford. There are also many European-style (cultured) butters on the market today which you may want to try as they have an excellent flavor. I know that buying vanilla extract can also be a challenge as there are so many choices. The first thing to do is to make sure that it is labeled "pure". Stay away from the ones labeled "imitation" vanilla extracts as they are made with synthetic vanilla and may leave a bitter aftertaste. These cookies are delicious plain, but they can also be flavored with ground nuts or zests and they can even be sandwiched together with jam or preserves, dulce de leche, nutella, chocolate ganache, or lemon curd. 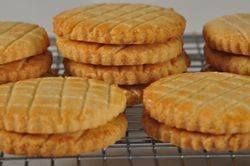 Sablés: Line two baking sheets with parchment paper or butter, or spray your baking pans with a non stick spray. In the bowl of your electric mixer (or with a hand mixer), beat butter and sugar until light and fluffy (2-3 minutes). Add the egg and vanilla extract and beat until incorporated. In a separate bowl, whisk together the flour, baking powder and salt. Add the flour mixture to the butter mixture and beat just until incorporated. Transfer the dough to a lightly floured work surface, knead the dough a few times to bring it together, and divide the dough in half. Then roll each half between two sheets of parchment or wax paper until it is about 1/8 - 1/4 inch (.25 -.5 cm) thick. As you roll, periodically check the top and bottom sheets of parchment and smooth out any wrinkles. Place the dough on a baking sheet (along with the parchment paper) and place in the refrigerator until cold and firm (about 45 minutes). (For faster chilling, place in the freezer for about 15-20 minutes). Meanwhile preheat your oven to 350 degrees F (180 degrees C) and place the oven rack in the center of the oven. In a small bowl, whisk the egg with the water for the egg wash. Remove the cookies from the refrigerator and brush the tops of the cookies with the egg wash. Then, with the tines of a fork (or I like to use the end of a toothpick), make a crisscross pattern on the top of each cookie. Bake the cookies for about 12 - 14 minutes or until golden brown around the edges. Cool cookies on wire rack. Store in an airtight container for up to a week. The cookies can also be frozen.